Rotary GBI President Debbie Hodge is back with her third instalment of Debbie’s Diary. September began with a new look Governing Council. We are now working completely with action-led agendas and outcome-led minutes. The key activity for me over the month has been charter anniversaries – clearly clubs were very busy back in the Septembers of 1923, 1938, 1968 and 1978 when the Bedford, Glossop, Cleveland and Northwick Park Rotary clubs were founded. Each event was different, each celebrated past achievements and successes, some recognised long service, some had cakes – but pride was much in evidence, pride in the club, pride in what had been achieved, and pride in being a member. More than one event talked about the future and shared plans to continue to be the inspiration that transforms lives – thank you all for including Mike and I in your celebrations. While attending these events we have been able to share in the life of the clubs and learn a little of the communities and connections they live and work in. One very interesting conversation with key individuals at a housing estate community hub highlighted the issues families are facing with the change to Universal Credits, the new payment system being rolled out across the country. The Cleveland Cub are looking to support that transition which will see family’s having a monthly payment not a weekly one, with budgeting and money management lessons, alongside the debt management programmes already in place. I can now say I have been to J M Barrie’s home town – Kirriemuir, and spent a very pleasant evening at their fundraising dinner, hearing about the work they are doing in Nepal. We were also able to connect them with members in the Heart of England, who are also doing significant work in Nepal. Perhaps one of the key roles within the job of president is that of making connections. Some of those connections are about joining the dots in Rotary, others link the working life with Rotary. One of those work-Rotary links came about at Northwick Parks celebrations. My dinner companion was an honorary member who has various roles in retirement, one was of particular interest to me – the independent review work he does for those detained in custody. This led to a conversation on the role of chaplaincy in this – which was opportune because the previous day I had been talking with the new National Leader for Police Force Chaplaincy – who said Rotary and work don’t mix! Over the month I have been with Rotary members at the University of Kent in Canterbury for their Conference – and a great time was had, I even got the opportunity to throw ducks into the river for the duck race and play with the steel drum band! I also got up close and personal to one project that is set to share Rotary with the world. 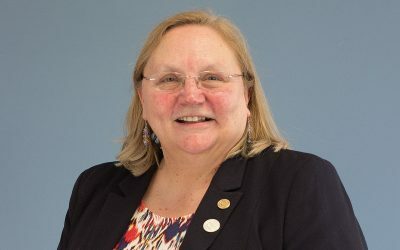 Rotary Radio UK is set to launch in October, and I was able to hear the story of its journey and to record an interview to be aired at a suitable time. I have also been to two district meetings – both held in schools with excellent facilities and in the heart of the local community. Paying a visit to the Lord Nelson – Jubilee Sailing Trust, an organisation enabling disabled people to sail. In Bromsgrove, Rotary Heart of England Rotarians shared plans for building their public image and PR opportunities and championed their conference as an opportunity to network and do joined up Rotary. In Perth (Rotary North Scotland) members met and spent the day looking at some of the policies need to ensure Rotary is operating within the law, as well as hearing about global grant projects. You can read about a number of global grant projects in the latest Rotary magazine of course! 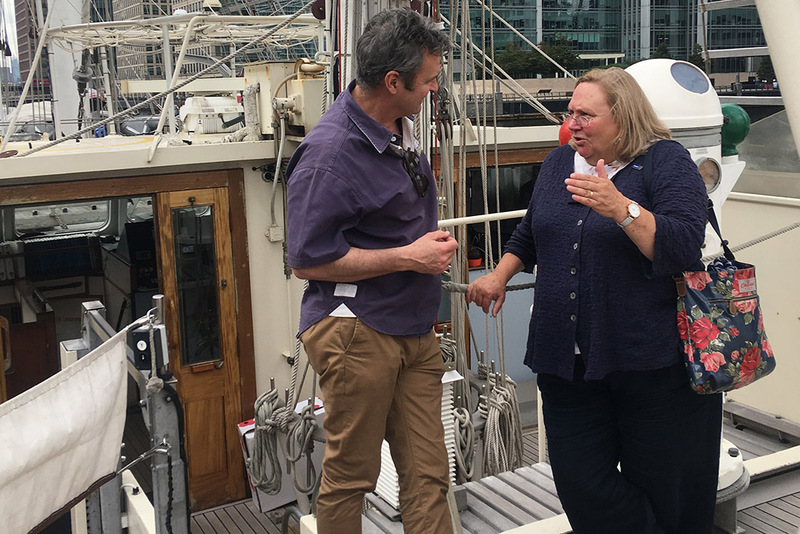 I have found time to visit the Lord Nelson – Jubilee Sailing Trust when moored in London’s Docklands, Mercy Ships offices in Stevenage, and a visit to the newly formed Rushcliffe Club to share information on our Conference and Showcase 2019 in Nottingham. All in all an inspiring month celebrating the past, but most definitely looking to build Rotary for the future.